Selected Science News: CAN CACTI 'ESCAPE' UNDERGROUND IN HIGH TEMPERATURES? CAN CACTI 'ESCAPE' UNDERGROUND IN HIGH TEMPERATURES? In the scorching summer heat of the Chihuahuan Desert in southwest Texas, air temperatures can hover around 97°F (36°C) while at the surface of the soil temperatures can exceed 158°F (70°C). Encountering these extreme temperatures, plants must utilize creative methods to not only survive but thrive under these difficult and potentially lethal conditions. This new work by Dr. Gretchen North and colleagues, published in the December issue of American Journal of Botany (http://www.amjbot.org/cgi/reprint/ajb.1000286v1), sheds light on how one desert resident, the cactus Ariocarpus fissuratus, copes with the effects of high temperatures. "One crucial point is that small desert plants such as the 'living rock' cactus occupy one of the hottest habitats on earth, the surface of desert soils" stated North. 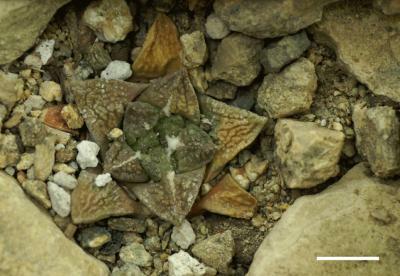 Ariocarpus fissuratus earned its nickname "living rock" because it blends into the rocky surroundings with its small stature that is level with the soil's surface. The researchers hypothesized that the cactus could "escape" high temperatures by moving more of itself below the soil surface where it is cooler. Measuring changes in plant depth and root anatomy, North and co-workers determined that the cactus moves deeper into the soil by contracting its roots. But does root contraction play a protective role by modulating temperatures? To find out, the researchers mimicked summer desert conditions by growing plants on a rooftop in Los Angeles, where air temperature was above 99°F for several days. All the cacti were grown in sandy soil, but half had rocks covering the surface of the soil, similar to their native habitats. For plants grown in rocky soils, the internal temperature of the stem was about 39°F lower than those grown in sandy soils alone. While this may seem like a small decrease, it had a significant effect on the health of the plants. Unlike the cacti grown in sandy soil which all died, those grown in rocky soil survived the intense heat. Root contraction aided in lowering the internal stem temperature, but only when combined with the cooling effects of the rocky surface. The opposite was true in sandy soil where cacti planted higher above the surface had slightly lower stem temperatures than those planted close to the surface. "Even in rocky soil, experimental plants attained nearly lethal temperatures during a summer heat wave in Los Angeles" said North. "Thus, root contraction and rocky microhabitats may not provide enough protection should desert temperatures get much higher due to global warming.